Jamia Hamdard Placements: Jamia Hamdard University, New Delhi welcomes the companies for not only recruitment but also to collaborate in the areas of research and development. The students are given proper guidance and training before the placement rounds. The University also welcomes the companies for pre-placement talks to get to know the current requirements in terms of candidates and train the students accordingly. The internship is provided by Jamia Hamdard University, New Delhi with a stipend of 2000-1000. The key companies who come for the final placement are IT, finance, marketing, sales, manufacturing (TCS, Pfizer, mankind). The average salary is 3 Lakhs and highest salary - 5 Lacks, 90% students get placed in my course. I haven’t done any internship yet. Many MNC's hire our students with an average salary of INR 5,00,000 to 6,00,000 per annum. We have good alumni network. There are numerous workshops conducted by the department of Engineering Sciences and Technology for which they give credit and certification. TCS and Wipro are two main companies that come for placement. Among them TCS being the main recruiter. Around 50-60 students are hired every year. Internship options are not provided to the students at Jamia Hamdard University. Alumni network is quite good. But there is no placement for BBA students. You can apply for the internship after completing your course. After completing 3 years, 6-month internship was compulsory.but from this year the internship has been left now it's only for 3yr.and in Jamia Hamdard they have own hospital that is HAHC hospital 1000 bedded hospital. The placement is 100% and the average salary is INR 15000 -18000 per month. 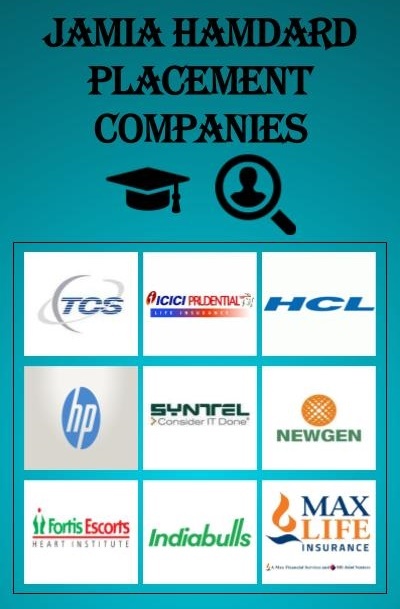 Tcs hcl wipro and many more companies will come for hiring students at Jamia Hamdard University. B.tech M.tech and MCA students will get placed every year. In Jamia Hamdard University, New Delhi companies like TCS, cybernetic profit, jk tech, etc hire students at end of 5th-semester exam. Internships are provided at Jamia Hamdard University along with a stipend. The salary package is Rs 45,000 per month. I am not aware of the alumni network in Jamia Hamdard University, New Delhi. I havent done any internhsip. Average salary may be INR 25000 or less and highest may be INR 1 lakh. About 85 % students get placed. There are no placements available through college. No internship I have done so far. I am still studying. Other stream students are getting good salary. University holds alumini meet every year.